Paige Shealyn: C O Z Y Holiday Essentials! C O Z Y Holiday Essentials! It's that time of year where I'm constantly styling anything cozy! I'm sharing a few of my Holiday essentials that will keep you comfortable and warm. The great thing about these picks is that you can take them right into the New Year. If you've been following my blog before you know I'm all for a cozy, neutral and versatile wardrobe! It's that time of year where you want to look cute while keeping warm. So when it comes to dressing up I love styling cute Winter knits. This sweater dress from Dynamite is the perfect combination of trendy and comfort. 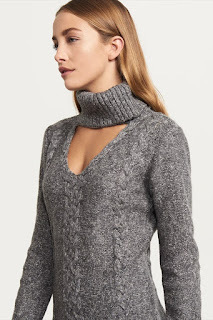 I love the cut out detail on the front - it sets it apart from other sweaters. It would look perfect styled with booties or over the knee boots. Next up we have fuzzy sweaters. If you've been following my Instagram you know I can't stop wearing them. This White Garage sweater will go with everything! Wear it at home with loungewear/slippers! Then dress it up for date night. It would look amazing with Black faux leather leggings. You can't go wrong with this versatile addition to your wardrobe. It also comes in a soft purple shade if you want more colour. 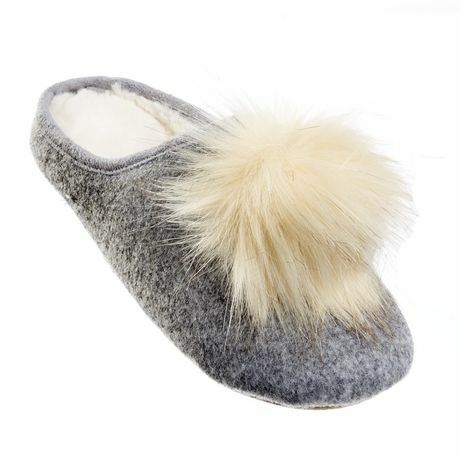 Last but not least - a girl needs slippers! This pair is so comfortable - my most worn. The pompom detail is so cute, I couldn't not get them. I would recommend going up one size in these - I did and they fit perfectly. Thank you for reading. Hope you are having an amazing Holiday season. Wishing you all the best in 2018. Thank you for supporting my blog.